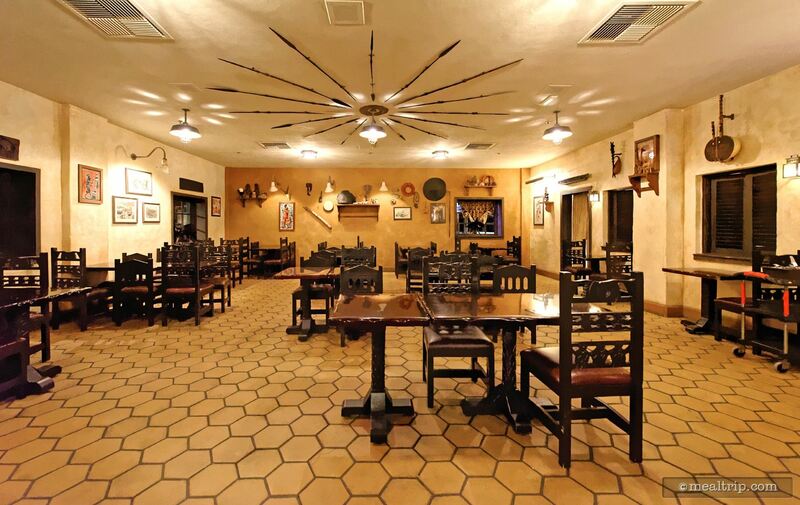 With design cues from a Harambe marketplace, the main buffet room is a colorful and lofty work of art. Wondering eyes looking up and around in any of the Tusker House rooms will be met with African inspired details and captioned photos. 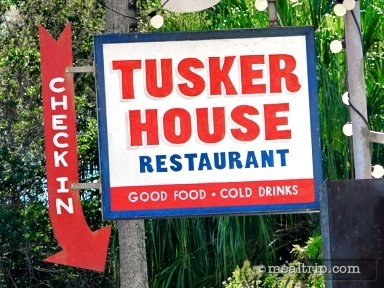 The cuisine at Tusker House is more American than anything, with only slight spice nods to African flavors. There are a couple of kid-centric (i.e. low) buffet tables with very common foods (i.e. 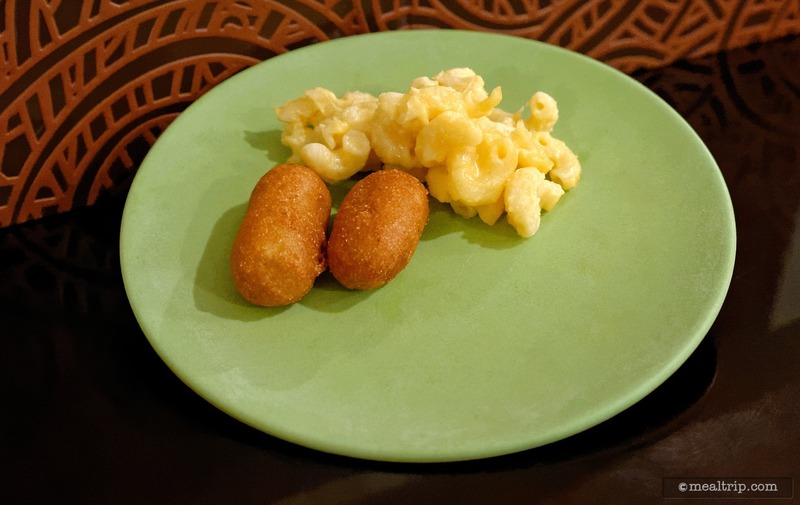 mac & cheese, hot dog nuggets, etc.). 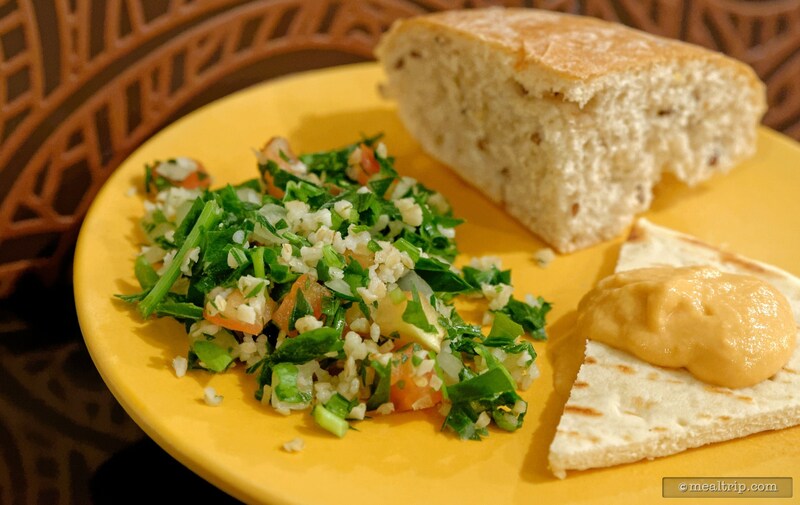 The "stations" are well spaced and start with bread and spreads, followed by salads, then into the warm vegetables and a few "featured" stew or spiced shrimp options. Tusker House still has it's own giant 18-foot rotisserie dubbed the “Wall of Flames” where carved meats and salmon are grilled. A dessert station is in the center of the buffet area. 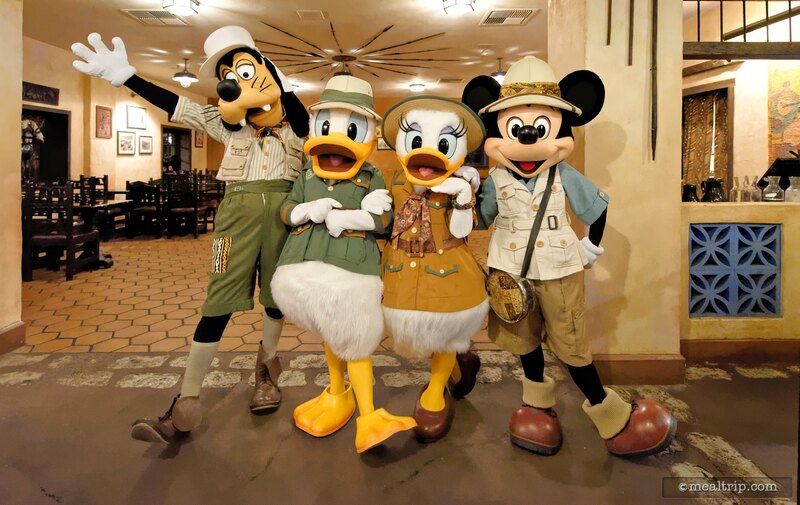 The characters at Tusker House are dressed in their "safari" outfits and usually include Mickey, Donald and Daisy, and Goofy. We have, on occasion, seen Minnie as well. Unless you are speed-eating, you will probably get to interact with each of the characters a couple of times during the course of a meal. The character interactions at Tusker House are so much fun! It's one of the few locations you can meet and interact with the fab four dressed in their safari gear. (Goofy, Donald, Daisy and Mickey … possibly Minnie … but never all five on the same day … usually … there's no rules here people, it's a theme park). 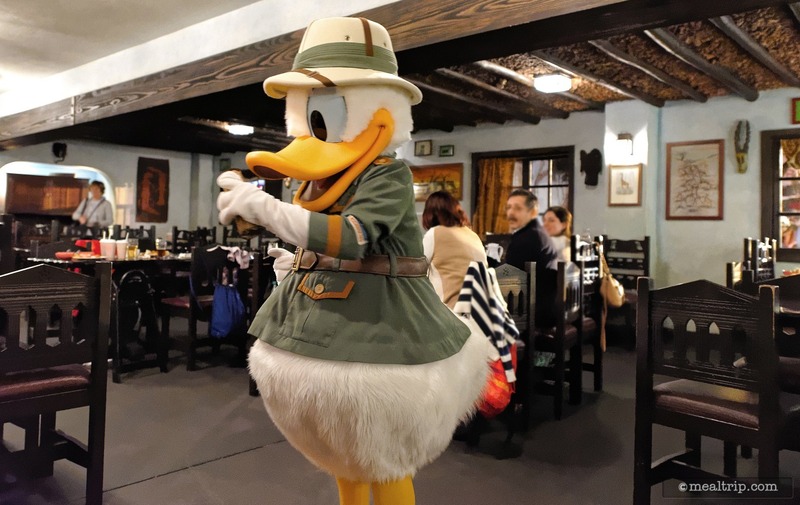 There is a decent amount of room in most of the dining areas for the characters to move around in and even though Tusker House is quite large, you seem to get ample time interacting with each of the characters. Like most of the character buffets at Disney, there's a little song-and-dance routine every now and again, where small (and sometimes large) children get to parade around with the character group. 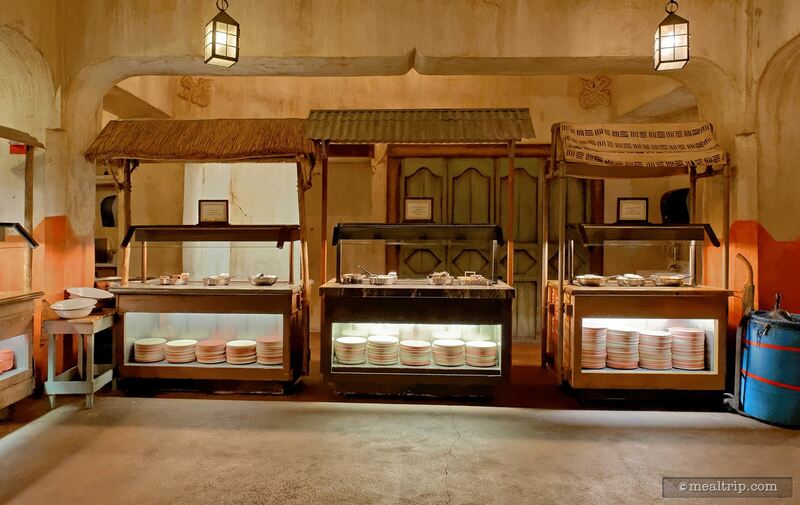 Because there's no real "path" at Tusker House, this part of the dining experience seems a bit confusing (to me anyway) but it probably doesn't matter much. From a value standpoint, just about all character buffets at Disney are the same cost these days, so there's not really any issue there. Mealtrip.com is mostly concerned about food though, and this is one area where it pains me to say, Tusker House just isn't what it had been when it first opened all those many years ago. Tusker House is located in the "Africa" section of Animal Kingdom. The thing that I love about eating in any "theme" park restaurant is the immersion level of the theme being represented. The interior design is here. The characters are properly dressed in themed attire. 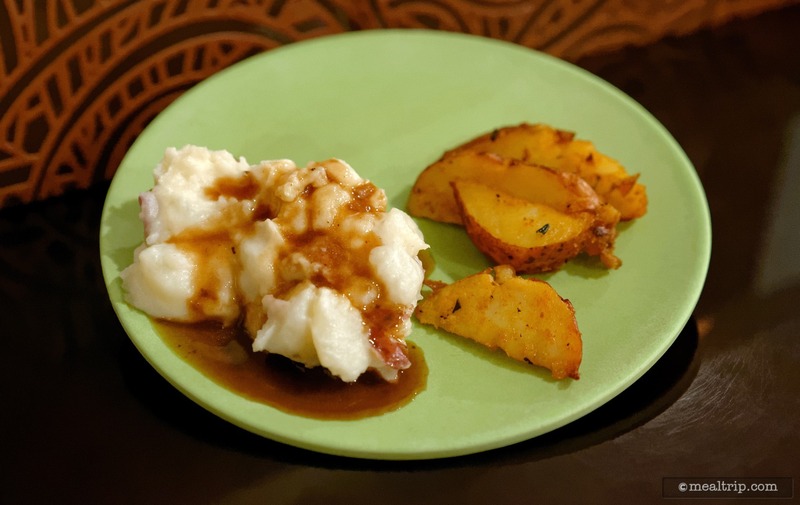 The background music works… why then… am I looking at a baked chicken drumstick, green beans, and mashed potatoes with brown gravy? 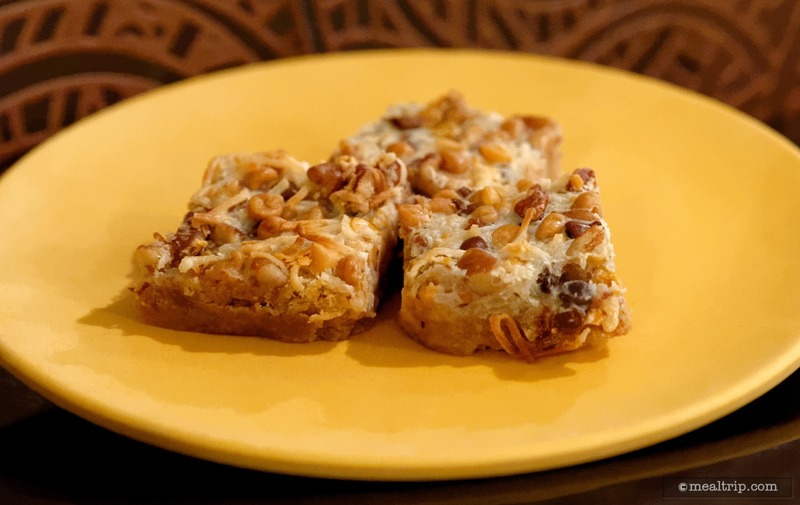 There are all kinds of cooking methods and spices (and spices does not have to mean "hot" spices) that are associated with the region and cuisine that we're talking about. 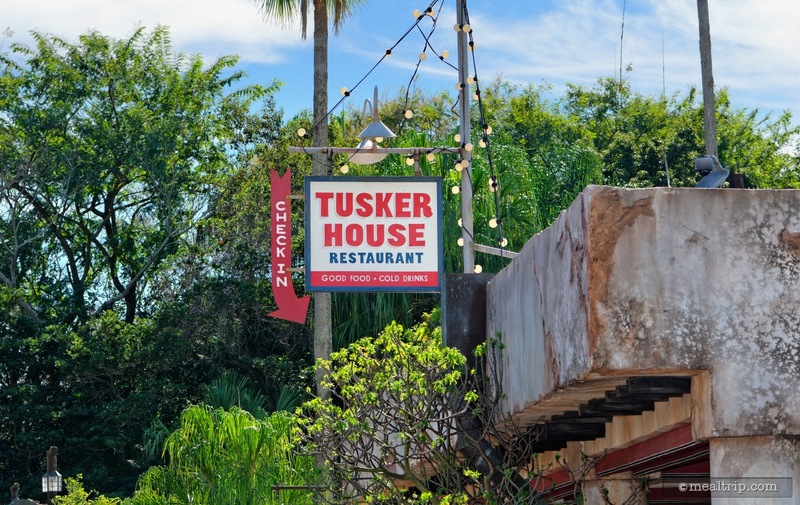 When Tusker House first opened (prior to the location being a "character" dining experience), there was a great mix of authentic vs western cuisine represented. Now… unfortunately I have to use a phrase that is too often used with character dining experiences… you're not coming for the food, you're coming for the photo-op with the charters. 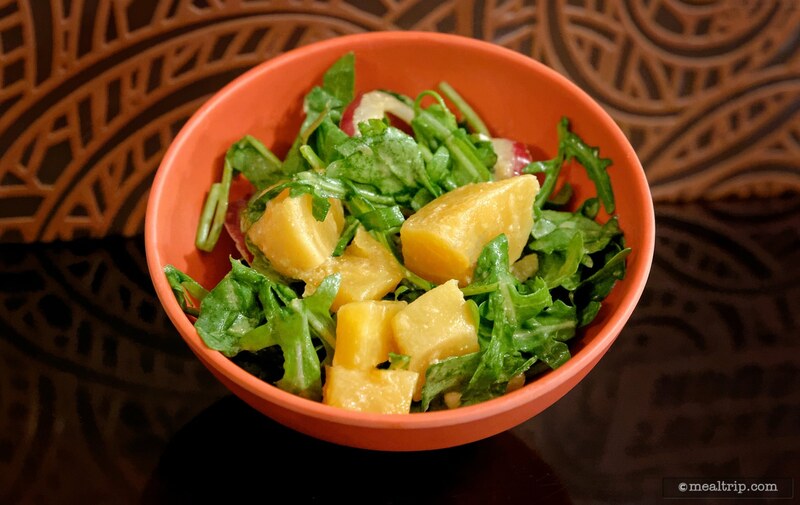 The flavors, cooking methods, and even variety has been normalized to the point where it can't be called anything other than "American Cuisine". I'm honestly not sure why they are even trying to "dust" this dish and that dish with something like curry, because it's not in an amount that's great enough for the character of the spice to come through… so it all just ends up being oddly named and slightly off tasting for even American food. One of the best items on the day that I visited for this review, was a peri-peri spiced, banana leave wrapped and baked salmon. 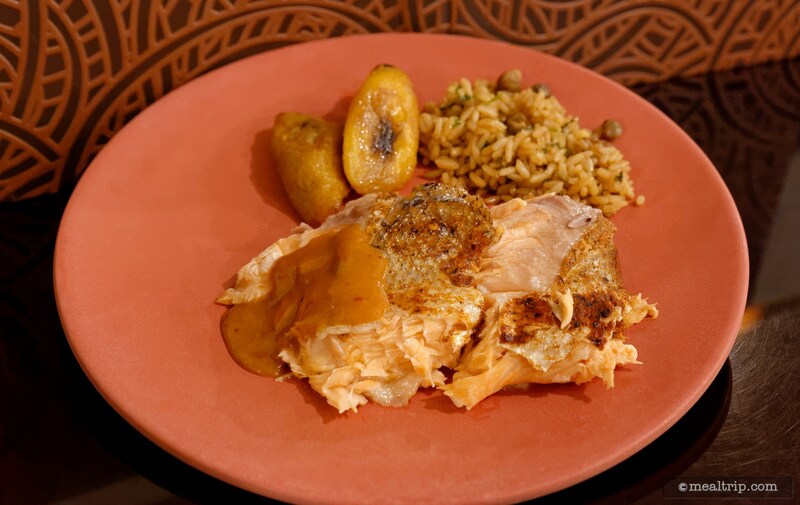 I love Verlasso Salmon… great product… and this dish was one of the meal's highlights to be sure… but I'm just not sure how many Verlasso Salmon are swimming around in the middle of Africa. Per-peri sauce? Yes. Banana leaves… plausible. Salmon… only in certain regions of South Africa really. I get it… I totally understand… all the food has to be palatable to all the guests… because everyone wants their photo with Mickey… not everyone wants to eat spiced Teff & Quinoa with Roasted Pork or Curry Seafood Stew. 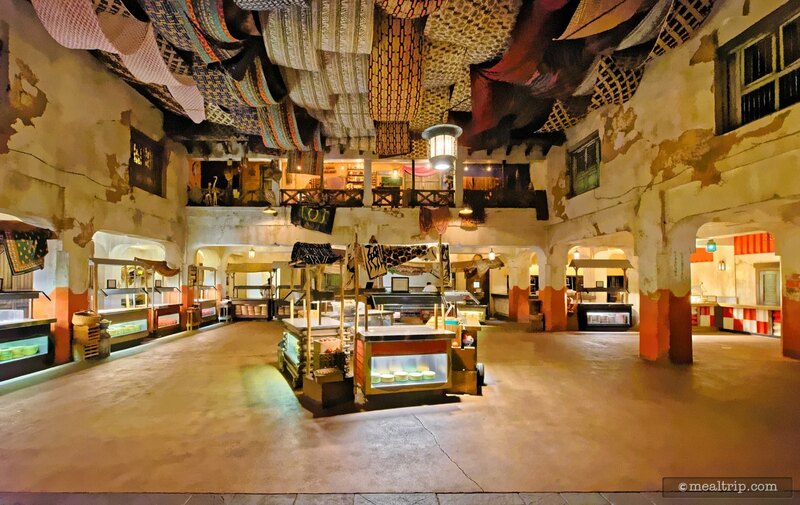 But at what point does it make more sense to just get rid of the food and turn Tusker House into a character meet and greet attraction? 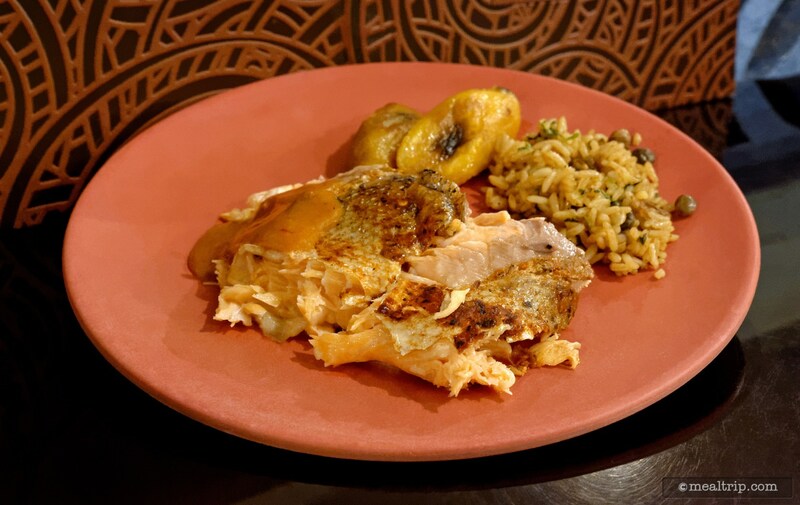 So… to recap… great characters, great environment, same price as most other character buffets… but if you're looking for even slightly ethnic cuisine… I'd recommend a small detour to Animal Kingdom Lodge's Sanaa, or heck… even Epcot's Spice Road Table and Tangierine Cafe. 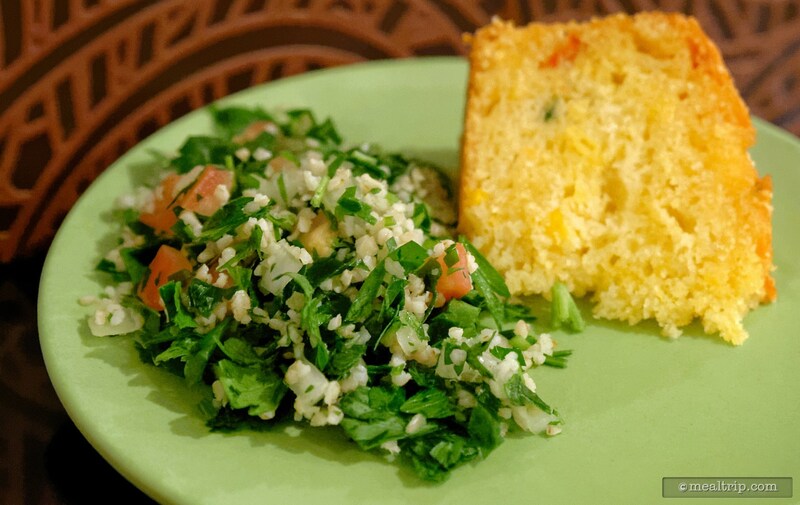 Yes, those last two are in the Moroccan Pavilion at Epcot, but the food being served is closer to North-West African fare, than what Tusker House is currently offering. CLICK HERE to view all 74 images in our photo gallery.